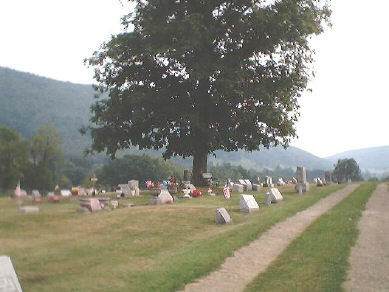 Cemetery is just over the line in Tioga county. In Potter Brook, turn south on Potter Brook Road. As soon as you cross the river, turn right onto the dirt cemetery road. Where noted, some entries have been expanded with cross-references to Harrison census data. To view the census data, open the census cited and search for a name. * = Dates calculated from existing dates and ages. ABBOTT, Edlah June (Croft). Spouse of Leonard D. Born 10-30-1920, died 11-27-2005. Age: 85 - Wed 3-14-1954 at Harrison Valley, three children. ABBOTT, Lewis B. Jr. Spouse of Helen Witter. Born 6-9-1929, died 1-10-2005. Age: 75 - Son of Lewis B. and Etta (Houghtaling) Abbott, born in Hector Twp. AMBURN, Iva Mae (Jones). Born 10-3-1939, died 11-2-1989 - Dau of George W. and Emily (Nelson) Jones. BARTOO, Eli William. Spouse of Mary E. Stebbins. Born 1849, died 1-5-1918 - Was a Preacher. Listed in 1850 Jasper, (Steuben Co.) Census. - Civil War Vet, Co A 85 NY INF. Enlisted in Jasper, NY on 9-25-1864. Received a $500.00 enlistment bounty. CARY, George W. Spouse of Emily. Born 1925, died 1995 - Son of Clarence and Myra (Seeley) Cary. CARY, Janet L. (Manning). Spouse of Gerald S. Born 10-4-1936, died 9-14-2017. Age: 80 - Dau of Ralph A. and Reva I. (Moon) Manning. Four adult daughters, surname unknown. Wed Gerald in 2006, he survives. CARY, Marie D. (Pennington). Spouse of Harold J. Born 11-11-1921, died 10-9-2017. Age: 95 - Dau of John Elmer and Vera Juanita (Snead) Pennington. Born in True WV, lived in Westfield PA. Wed 6-25-1938, four children. CARY, Myra (Seeley). Spouse of Clarence. Born 1898, died 1988 - Wed in 1916 at Whitesville NY, 8 children. COLE, Berwyn Gaylord. Spouse of Bertha M. Howland. Born 9-25-1924, died 12-21-1944 - Son of Dean and Flossie (Lane) Cole. - WW II, US Army 119 Inf 37 INE, PFC. Killed in the Battle of the Bulge. COLE, Elanor Arlene. Born 1921, died 9-1921 - Dau of Dean and Flossie (Lane) Cole. COLE. Phyllis (Cass). Spouse of Ronald F. Born 10-19-1921, died 1-21-2009. Age: 85 - Dau of H. Leon and Ida (Mills) Cass, born at Ulysses. Wed 9-27-1941 at Ulysses, 2 sons. CRIPPEN, Barbara J. (Blauvelt). Spouse of Howard L. Born 3-4-1945, died 9-10-2015. Age: 70 - Dau of William and Lillian (Gage) Blauvelt, born in Sodus NY, died in Ulysses PA. Wed 9-26-1964 in Williamson NY, two children. CRIPPEN, Cora LaBar. Born 1868, died 1940 - Also listed as DAVIS, Cora LaBar. CRIPPEN, Rial Jr. [Pup]. Born 3-20-1968, died 11-7-1993. Age: 26 - [In Loving Memory] Son of Rial and Pearl (Mattison) Crippen, Sr.
CRIPPEN, Roger L. Sr. Born 7-3-1949, died 7-5-2008. Age: 59 - Son of Louis W. and Arvilla M. (Seeley) Crippen. Born in Blossburg PA.
DAVIS, Evelyn V. (Joseph). Spouse of William L. Born 4-11-1919, died 9-9-2008 - Dau of Carl and Mildred Lane Joseph, born at Westfield PA. Wed 8-7-1937, five children. DUNHAM, Bonita (Houghtaling) [Bonnie]. Spouse of #1 Floyd E. Seeley, #2 Leon L. Dunham. Born 4-19-1931, died 9-6-2015. Age: 84 - Dau of Earl Clifton and Goldie L. (Glover) Houghtaling, born and died in Potter Brook PA.Wed 6-28-1948 in Harrison Valley PA, three children. (He d. 9-6-1980) Wed Leon 12-17-1982. ERICKSON, Roy B. Spouse of Beulah P. Works. Born 5-20-1901, died 7-28-2004. Age: 103 - Son of Edward and Caroline (Johnson) Erickson. Born in Galeton PA, worked at Eberle Tannery for 41 years. Wed 4-07-1928 at Potter Brook PA, six children. GLOVER, Roy L. Jr. Born 1931, died 1931 - Son of Roy L. Glover, Sr.
HANCOCK, Phyllis B. Spouse of Robert T. Born 8-12-1928, died ?? HANCOCK, Robert T. Spouse of Phyllis B. Born 5-2-1928, died 9-24-2001. Age: 73 - Son of Robert T., Sr. and Iva (Tanner) Hancock, born in Westfield PA. Wed 8-17-1947. HANES, Gregory S. Born 5-28-1965, died 8-11-2017. Age: 52 - Son of Frank and Joyce (Houghtaling) Hanes. Born in Blossburg PA, lived in Westfield PA, died in New Castle PA. One daughter. HANES, Herbert L. Born 1929, died ?? - Buried with Naomi L.
HANES, Naomi L. Born 1933, died ?? - Buried with Herbert L.
HARMON, Lehman D. [Wayne]. Companion of Lottie Slaby, died 11-29-2015. Age: 69 - Died in Gaines PA.
HOUGHTALING, Actie Armenta (Wallace). Spouse of Marion W. Born 11-19-1859, died 1-4-1930 - Dau of John and Julia O. (Langdon) Wallace, II. HOUGHTALING, Jamie L. Spouse of Sarah Douglass. Born 4-9-1976, died 7-28-2009 - Son of Marion R. [Cub] and Sandra (Young) Houghtaling. Wed 7-13-1996 in Westfield, PA.
HOUGHTALING, Marion Wilbur. Spouse of Actie A. Wallace. Born 11-13-1855, died 7-29-1945 - Son of George R. and Mary A. (Holt) Houghtaling. HOUGHTALING, Ruby P. (Glover). Spouse of Harold C. Born 12-20-1909, died 10-13-2006. Age: 96 - Dau of Delbert and Eva May (Tanner) Glover, born in Hector Twp. Six children. HURD, Robert F. Spouse of Beverly J. Colby/ Patricia Palmatier Hunt. Born 12-18-1933, died 11-18-2009. Age: 75 - Son of Herman and Anna (Torrence) Hurd. Wed Beverly11-9-1957 in Galeton. Wed Patricia 6-18-1992 In Potter Brook. JOHNSON, Emma M. Spouse of Eugene. Born 1863, died 19?? JONES, Kenneth. Spouse of Regenia. Born 1918, died 1989 - [Two Hearts Beating as One] Prob son of George W. and Emily (Nelson) Jones. LAMPMAN, Charles F. Spouse of Pauline [Pam] McDoel. Born 11-15-1944, died 7-31-2012. Age: 67 - Son of Hugh and Ruth E. (Merrick) Lampman. Born at Coudersport PA, a tannery worker and logger. Wed 7-8-1995 in Woodhull NY, one son. LAMPMAN, Tyler D. Born 7-27-1996, died 10-19-2009. Age: 13 - Son of Gary and Connie (Necomb) Lampman, born at Coudersport PA.
LOZIER, Sylvia (Ross) Johnson. Spouse of Paul D. Johnson/ Jesse E. Born 3-5-1949, died 1-4-2012. Age: 62 - Dau of Clifford and Mabel (Counsil) Ross, born in Lock Haven PA. Three children with Paul. MANN, Pearl (Persing). Spouse of Joseph Simmons/ Issac. Born 5-130-1897, died 9-18-1940 - [burial record] 2nd wife of Isaac. MANNING, Mary A. Born 1883, died 1977 - Dau of A. D. and Carrie (Butler) Persing, born at Nelson PA. Four step-children, no natural children. METCALF, Doris M. Born 1925, died Uncut - Prob spouse of Wilbert R.
METCALF, Wayne R. [Tiny]. Spouse of Connie Schoonover. Born 1-8-1943, died 6-4-1994. Age: 51 - Son of Donald Fred and Mary R. (Teater) Metcalf. Wed 4-25-1964 in Wellsville NY, one son. METCALF, Wilbert R. Born 1924, died 1977 - Prob spouse of Doris M.
MORGAN, Shirley V. (Hanes). Spouse of Morris E. Born 3-15-1941, died 4-23-2010. Age: 69 - Dau of Eugene and Emma Johnston Hanes, born in Blossburg PA. One dughter. NICKERSON, Joseph. Born 5-16-1953, died 11-24-1969 - Ptob. son of James E and Lillian (Cornelius Nickerson. ORCUTT, Robert W. Born 4-16-1948, died 7-19-2015. Age: 67 - Son of Harold W. and Ruth E. (Truax) Orcutt, born in Wellsboro PA, d. Rochester NY. ORCUTT, Ruth E. (Traux). Spouse of Harold W. Born 6-18-1920, died 5-10-2014. Age: 93 - Dau of William R. and Agnes M. (Robbins) Truax. Born in Potter Brook, a dairy farmer. Wed 10-26-1942 in Harrison Valley, 2 children. ORDWAY, Hattie Mae (Ayers). Spouse of Walter Mattison / John Ordway. Born 4-1880, died 1941 - Adopted at birth by Jeptha L. and Mary J. (Herrick) Ayers. Birthname was Vallen. Wed John about 1919. PADDOCK, Genevieve (Kelly). Spouse of Charles D. Born 8-25-1917, died 11-7-1997 - Dau of Archie and Rose (Wakely) Kelly. PLANK, Dimon. Born ? ?, died ?? PREDMORE, Charles M. Born 1852, died 1925 - [at rest] Prob spouse of Emma D.
PREDMORE, Emma D. Born 1857, died 1950 - [at rest] Prob spouse of Charles M.
PUTMAN, Paul E. Companion of Bonnie Morton. Born 12-18-1949, died 2-13-2016. Age: 66 - Son of Paul E. and Lola M. (Traver) Putman, Sr., born in Wellsboro PA, died in Danville PA. Three children. REDMAR, Frances. Born 1936, died ?? SEELEY, Betty Jean. Born 1960, died 1960 - Dau of Guy R. and Ada (Ribble) Seeley. SEELEY, Edna (Wright). Born 1900, died 1962 - Dau of Harold L. and Crystal (Flynn) Wright. SEELEY, Richard G. Born 1959, died 1959 - Son of Guy R. and Ada (Ribble) Seeley. SEELEY, Virginia A. Born 1958, died 1965 - Dau of Guy R. and Ada (Ribble) Seeley. SHARP, Frank R. Spouse of Amy A. Houghtaling. Born 2-13-1931, died 5-3-2011. Age: 80 - Son of Melvin and Lillian (Knapp) Sharp, born at Binghamton NY. Wed 8-18-1950 at Harrison Valey, 3 children. SKINNER, James A. [Jamie]. Born 1962, died 1972 - Son of Glenn W. and Lynne Ann (Caulkins) Skinner. Killed in a playground accident. SLABY, William P. Spouse of Lottie. Born 7-11-1940, died 6-5-2011. Age: 70 - Son of William E. and Amelia (Misura) Slaby, born in Reading PA. Six children. SPERRY, Florence (Bartoo) Floss]. Spouse of Ray Erway/ Clifford. Born 1884, died 1925 - Dau of Eli and Ellie (Stebbins) Bartoo. Wed first in 1905, one daughter. STONE, Erastus H. Born 1845, died 1916 - Son of Samuel W. and Sally (Mack) Stone. (1850 Harrison Census) - Civil War Vet. Co M, 15th NY Eng. Corp, Artificer. UNKNOWN, Keith E. Born 1950, died 1988 - Could be Stratton-Potter???? VIERA, Genevieve (Cary) Hurler. Spouse of Arnold B. Hurler/ Gus H. Born 5-17-1920, died 1-17-2010 - Dau of Clarence and Myra (Seeley) Cary. Wed Arnold in 1932, 7 children. Gus 6-22-1991. WALTERS, Lillian L. (Cary). Spouse of Robert F. Born 9-2-1927, died 11-5-2009 - Dau of Clarence and Myra (Seeley) Cary. Wed 7-21-1945, 3 children. WHEELER, Juanita P. (Thompson). Spouse of Horace D. Born 11-29-1926, died 6-23-1986 Wed 1-21-1949 in Winchester VA, four children. WHEELER, Sharon L. (Outman). Spouse of Daniel C. Born 12-7-1956, died 11-4-2008 - Dau of Robert M. and Georgia (Graves) Outman, born at Coudersport PA. Wed 3-20-1977 in Galeton, two sons. WORTHINGTON, Angela J. Born 12-19-1979, died 12-19-1979. Age: Stillborn - Dau of Robert L. and Sandra (Houghtaling) Worthington, Jr. Grdau of Robert L. and Janice O. Worthington Sr.
WORTHINGTON, Reuben J. Born 11-1979, died 11-1979. Age: Stillborn - Son of Basil T. and Mary Sue (Terrell) Worthington. Grson of Robert L. and Janice O. Worthington Sr.
WORTHINGTON, Robert L. Sr. Spouse of Janice O. Born 1917, died 1986 - Son of ? and Nellie S. (Brenenstuhl) Worthington.